Orlando, FL August 27, 2014 Leading North, a full-service hospitality consulting firm specializing in maximizing topline revenues for hotels, announces today the launch of its new digital marketing and social media platform. The hospitality marketing leader has assembled a team of highly skilled and innovative digital marketing and social media experts to work closely with hotel revenue teams to provide specialized digital marketing planning and solutions in a uniquely integrated model. Leading North’s customized approach begins with a holistic evaluation of the performance data and analytics of how current strategies are performing. Each account is personally managed by a small, vested team that ultimately becomes a direct extension of the hotel’s revenue group. Based on key findings, the team develops a highly customized, integrated plan that includes a mix of A/B website variant testing, conversion metric testing, search engine optimization, pay for performance advertising, banner advertising, display marketing/retargeting, email communication and social media. In its fourth year, Leading North has established a portfolio of the who’s who in the hospitality industry with prestigious clients such as Highgate Hotels, Chartres Lodging Group, Northwood Hospitality, Kokua Hospitality, Bluegreen Vacation Resorts, DiNapoli Capital Partners, and SCS Advisors. Established in 2010, Leading North is a boutique hospitality consulting firm providing a full range of revenue generating services designed to positively impact the value of hotel assets. Leading North manages an elite team of sales/marketing, revenue management, e-commerce, and web development experts who specialize in analyzing hotel revenue performance and designing plans with executable solutions. Working with private equity firms and real estate investment trusts, Leading North tailors the engagement based on the specific need of the property then deploys the right expert to address the need. For more information, please visit: www.leadingnorth.com or email, mike@leadingnorth.com. 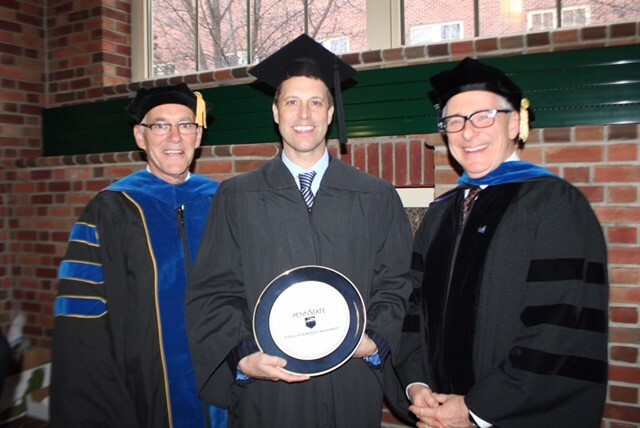 Penn State University, College Park, PA, December 19, 2015: Leading North’s president and founder Mike Schugt delivered the commencement speech at The Pennsylvania State University School of Hotel Management on Saturday December 19, 2015 for the fall 2015 graduating class. As a leader in the hospitality industry, Mike has had the opportunity to work with the industry’s largest brands and experts. As a Penn State alumnus, Mike has had the opportunity to apply everything he has learned, become a hospitality industry leader, and inspire the future hoteliers from the graduating class of 2015. Delivering a commencement speech for the graduating class was an absolute honor and a very humbling experience. “It was a very special moment for me to stand in front of the audience of students, family, and faculty and share with them some of my life’s lessons and learnings; it is an experience that I cherish and will not forget,” Mike explained. Mike Schugt and the entire Leading North team would like to congratulate the graduating class of 2015 and wish every one of the new graduates the best of luck in their future endeavors.